Reflecting the diversity of U.S. Hispanic culture, this festive Mass setting draws multicultural assemblies into full participation in the liturgy. Contains some Misal Romano texts that are not approved for liturgical use after 12/1/2018. Extremely popular for its festive combination of Latin American musical styles, this revised, bilingual (Spanish-English) Mass setting was written to draw multicultural assemblies into participation in the liturgy. Reflecting the diversity of cultures Hispanics bring to the U.S. from all parts of Latin America and the Caribbean, the mix of musical styles includes the huayno rhythm, which is used in the traditional music of the Andes. Written in Spanish and English, Nueva Misa Latinoamericana offers the flexibility of singing the parts entirely in either language or bilingually. 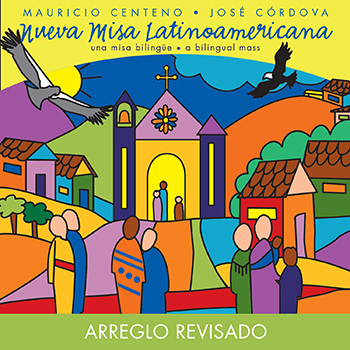 Extremely popular for its festive combination of Latin American musical styles, this revised, bilingual (Spanish/English) Mass setting was written to draw multicultural assemblies into participation in the liturgy. The lively rhythms and vibrant instrumentation will certainly add a celebratory feel to any liturgical celebration. Reflecting the diversity of cultures Hispanics from all parts of Latin America and the Caribbean bring to the U.S., the mix of musical styles includes the huayno rhythm, which is used in the traditional music of the Andes. Written in Spanish and English, Nueva Misa Latinoamericana offers the flexibility of singing the parts entirely in either language or bilingually.